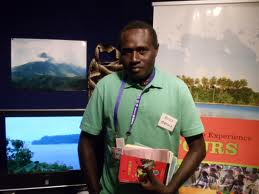 Bougainville Experience Tours offers our visitors a range of activities that can be included in your customised itinerary ranging from 1 to 7 days with special prices for International tour operators (Groups, FIT and cruise ships) ,Direct International guest bookings , budget travellers and children. 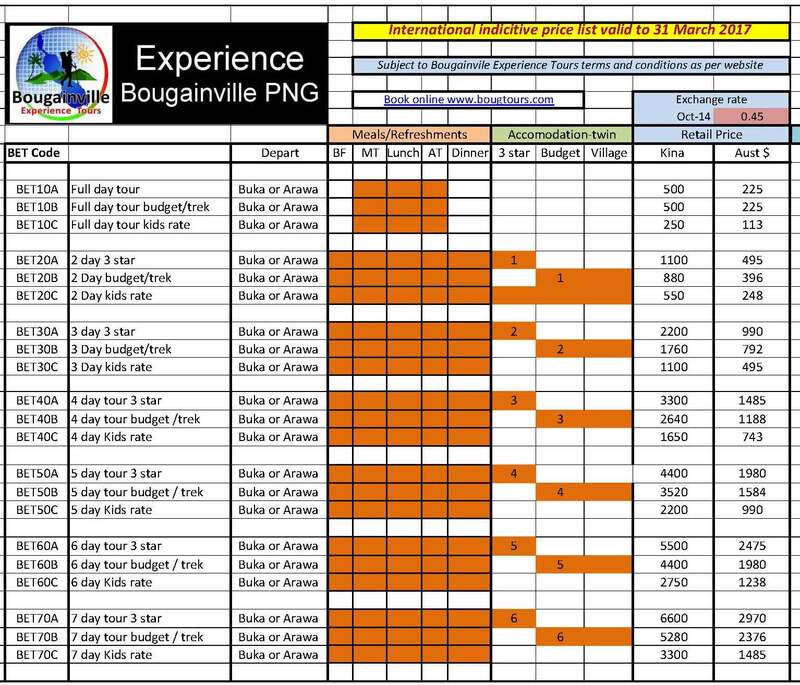 All retail and wholesale prices and bookings are valid until 31 March 2016 but are subject to Bougainville Tour experience Terms and conditions. From early 2015 with the opening of the new Aropa Airport near Arawa/Kieta all our tours should be available from both airports. Attend a Festival: One of the top reasons to visit Papua New Guinea and Bougainville is to experience the thrill of seeing one of PNG’s many cultural festivals, or sing-sings. Many sing-sings are annual events with tribal groups traveling from all over Papua New Guinea that travel far to take part in the remarkable gathering of sights, sounds, colour, beauty and culture. Some of the top festivals include the Mona Festival Bougainville the Goroka, Mt. Hagen & Hiri Moale festivals. Scuba Dive: Papua New Guinea and Bougainville is also home to some of the world’s most amazing diving. Divers can enjoy beautiful barrier reefs, coral walls, fringing reefs and World War II wreck sites. With average water temperatures of 78 – 85 degrees Fahrenheit and great visibility year round you’ll be sure to enjoy the breathtaking biodiversity Papua New Guinea’s and Bougainville waters have to offer. Stay in a Village: Village stays are one of the most unique ways to experience Papua New Guinea and Bougainville, but not for the fainthearted traveler. With over 800 distinct languages spoken, and a land filled with a mixture of traditional and modern living you’ll be sure to get a once in a lifetime experience. 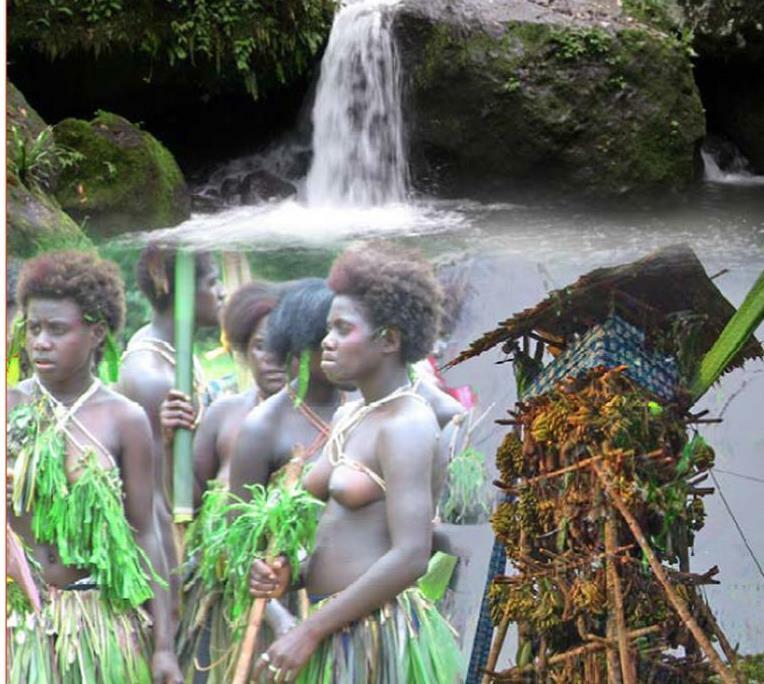 Immerse yourself into one of the many villages within Papua New Guinea and learn about men vs. women’s responsibilities, traditional customs and beliefs, and various rituals that happen throughout daily life. Go Hiking/Trekking: For those travelers looking for an action packed holiday, a hiking or trekking adventure would be a great choice. Papua New Guinea and Bougainville is a popular destination for those interested in mountain climbing and bushwalking. You’ll see beautiful towering peaks, national parks, hidden villages, World War II relic sites and much more. Those interested in hiking in PNG should be sure to be in good physical condition as many of the treks can be physically and mentally challenging, but in the end very rewarding. 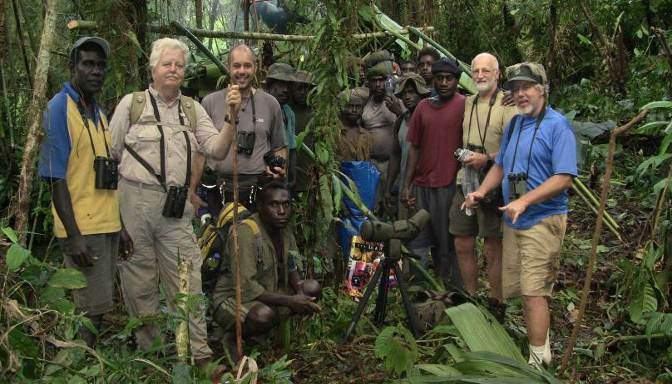 Birding: For any bird watching aficionado Papua New Guinea and Bougainville is a birder’s paradise. You’ll have endless opportunity to see thriving bird populations, as well as endemic and exotic species of all kinds. One of the main highlights for those traveling to PNG, are the many species of the famous Birds of Paradise. These are found only in Papua New Guinea, and are truly a magnificent site to see. Art Collecting: Papua New Guinea and Bougainville is home to some of the most mysterious and beautiful artwork in the world. On an art collecting adventure you’ll not only be able to bring amazing pieces of artwork home for your personal collection, but you can see some of the artwork PNG is known for such as their Spirit Houses decorated with carved ancestral figures, shell jewelry, woven fiber masks and so much more. Come back home with a piece of artwork found only in Papua New Guinea. Kayaking: The islands & Fiordland regions of Papua New Guinea and Bougainville will take your breath away, and there’s no better way to experience these exceptional locations than by kayak. Encounter schools of playful dolphins, sea turtles and villages slipped away in idyllic settings. The best time of year to enjoy a kayaking adventure is from April to November when the seas are typically calmer. Colorful and bio diverse coral reefs, striking coastlines and untouched tropical waters are waiting for you to come enjoy. Go Surfing: Papua New Guinea and Bougainville has unlimited surf potential from October to April, and thousands of miles of coastline waiting to be explored by surfing enthusiasts. Enjoy the warm waters, consistent waves, and pristine coastlines on your next surfing adventure. Fishing: Papua New Guinea and Bougainville offers remarkable fresh and salt-water fishing, and enjoys isolated fishing grounds teeming with life. Try your hand at fishing for Barramundi, or maybe you’ll like being challenged by the Sailfish, Yellow fin tuna or Marlin that inhabit the waters around Papua New Guinea and Bougainville .